Experience the virtues of amazing efficiency and performance with this super model. 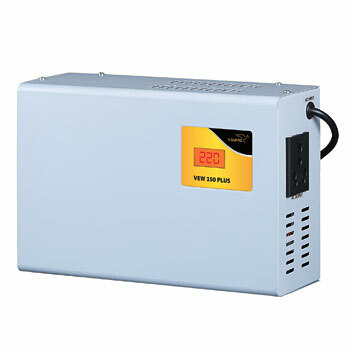 Electronic voltage stabilizer for one deep freezer/Air cooler/0.5 Ton AC/1000VA Digital UPS – Be amazed at this fully electronic voltage stabilizer model that helps to protect various connected devices from harms caused by dangerous voltage variations. Fail Safe Circuit Protection – This top-notch technology enables power supply cut off to connected equipment in case of component failure and offers exemplary protection. Built-In Thermal Overload Protection - At times when temperatures rise beyond the desired level, chances for damage are pretty high. This feature protects the stabilizer and compressors during high temperature burnout. Wall Mounting Cabinet Design – This model is not just about high efficiency, but also unmatched elegance. It comes with an attractive cabinet that perfectly blends with your interiors.